Elder Scrolls games never die. Instead, they're polished and retextured forever—kind of like Meryl Streep in Death Becomes Her, only without all the rotting. 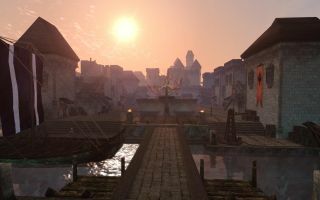 Morrowind Rebirth, the long-running Morrowind overhaul mod has posted a single screenshot of its upcoming 3.0 release. It offers a taste of the improvements planned for the Imperial stronghold of Ebonheart. In case you're suffering a bout of the nostalgia, here—courtesy of UESP—is what vanilla Ebonheart looks like. Morrowind Rebirth overhauls the visuals of the third Elder Scrolls game, and adds a bunch of new weapons, items, creatures and fixes. You can see a round-up of its existing features courtesy of the trailer below. The 3.0 release is due "soon".